In an effort to curb spending on human capital while still allowing companies to utilize high-performing CRM software, BrainSell is offering zero percent financing on SugarCRM software and services. BrainSell is the first vendor to offer a monthly payment option as opposed to a yearly, upfront cost. The breakthrough financing decision applies to all paid versions of SugarCRM (Professional, Enterprise and Ultimate), and comes as a welcome step forward in getting first-year and repeat Sugar users a billing cycle that works for them. BrainSell is also offering zero percent financing on engineering and training services. Integrates with many of the most popular ERP (accounting) and marketing automation platforms. BrainSell knows that price is only part of selecting a best-fit CRM, but according to Sonja Fridell, BrainSell’s GM, it is among the most important. 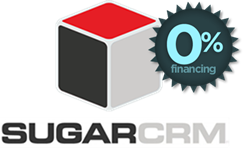 To explore SugarCRM and BrainSell’s financing options, visit their financing page.